Next week, we're adding a new, socially-minded aspect to our offer of financing models. Starting at 12 p.m. on 21 March, there will be a new asset class on Companisto in addition to start-up financing and venture loans: The impact loan. Impacts loans are designed for businesses that seek to unite profitability and success with socially or ecologically-oriented value creation. Our thought on the matter: Just as it's crucial for an economy to continue developing by creating new technologies, products, and services, so too is it important to simultaneously strive to ameliorate social issues. In the area of social entrepreneurship, businesses commit themselves to an ecologically and socially-minded attitude towards problem solving and are able to create solutions through sustainable, profitable businesses. A social approach plus profitability: Not everyone is aware that it's possible to make an economic profit instead of having to depend on grants. Many businesses decide to take an approach that focuses on either social causes or profits. But some "social entrepreneurs" connect these aspects with one another. They work on socially-relevant solutions without making compromises to revenue and profit. In fact, with this model, profit is at the forefront. Our aim is to support these entrepreneurs through impact loans. They will receive a fixed interest rate (8% per year), which is paid out on a semi-annual basis. 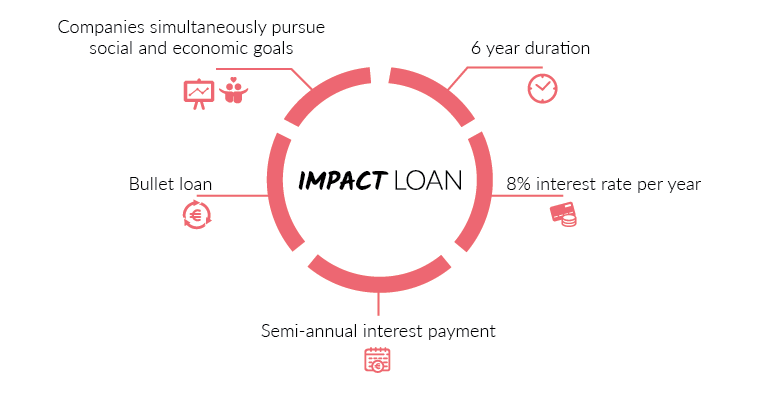 Impact loans have a duration of 6 years. In terms of its basic structure, the investment model is similar to that of our venture loans, which we've already successfully financed. We look forward to supporting many new start-ups and founders of this new asset class. In the coming weeks, we will be presenting you our new ideas together with the founding team of our first social business– we look forward to an exciting exchange with you!